Our Molde cruise port guide gives you information about the docking location, cruise dock, transportation options and much more! 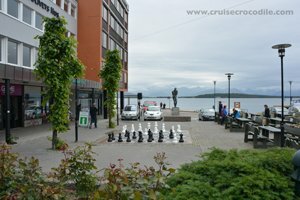 Welcome to the Molde cruise port guide. 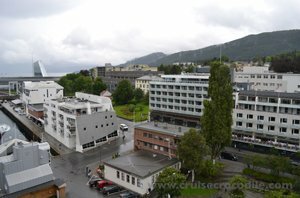 Molde is a small town of 26.000 in Norway. It is beautifully located in the Romsdalfjord. It is one of the oldest ports in Norway because of its dramatic scenery. Cruise ships have been coming here since 1882. The town of Molde has a nickname: the town of roses. It is quite a modern city. Mode was bombed during WWII and has rebuild its town mainly in contemporary and Art Nouveau style. There is part of the old town that remains however. Therefore walking through Molde is like walking through the centuries while enjoying the beautiful display of roses. Although today the editors of cruisecrocodile.com wouldn’t consider it to be the best port of Norway it is nice to have on the itinerary. People often choose to stay in town and visit the open air museum and the church or if you would favour some more dramatic scenery this would be the port to go and visit the famous Atlantic Ocean Road. When your ship is docked this will be your view over the town. You are right in the city center of Molde. From here it is about 300 meter to the main square. Maps will be available at the cruise terminal and the tourist information center is available in town. Check their location on the map. There are many hikes in the area that are all connected to each other. Bring the map that is provided in the port for some suggestions, visit the tourist information in town or simply find one of the many hiking information signs in Molde. A hike of 6 km uphill will bring you to the Varden viewpoint where you can overlook the 3 fjords and mountain tops. This is the most popular hike in the area. To reach Molde your ship will need to sail into the Romsdalsfjord. This sail in is absolutely gorgeous. Cruise Crocodile will soon publish a scenic cruising guide for you take with you on board. From the ship you can already spot this beautiful church. This is the 3rd church to be located at this port. It is a church designed by Finn Bryn. It was completed in 1957. Build for a the cost of 3 million NOK. Note the beautiful free standing bell tower and keep an eye out for the beautiful roses around the cathedral. Molde is not only known for its roses in town, but also for the wonderful statues you find all over town. This one is the Jazz boy that stands at the main square. At about 52 km from port is where you will find the Atlantic Ocean Road. This road is labeled as one of the world’s best road trip. It is a 8,3 km road over a string of islands that is connected by 7 low bridges. Get here by taxi, excursion or public bus. Visit the visitors centre, stretch your legs at one of the viewpoints or simply drive over the road. Whatever you do, whatever the weather, it will be spectacular. Molde has a dock available where cruise ships can dock. The dock is close to the city center of Molde. Read all about what to see and do in and around port in the full Molde cruise port guide. Half way on the Atlantic Ocean Road it is possible to take a boat to Haholmen island. This is the perfect serene spot to enjoy some coffee, norwegian waffles and a good set of knowlegde about the unique viking ships. The exhibition is stunning and so are the islands. If you are planning to go to the Atlantic Ocean Road, you might want to make this an additional stop.